Illustration © The Estate of John David Roberts. Reproduced with the permission of the William Roberts Society. Text © David Cleall, from Sarah MacDougall and Rachel Dickson (eds. ), Uproar! The First 50 Years of The London Group 191363 (London: Ben Uri and Lund Humphries, 2013). William Roberts was elected to the London Group in 1914, and showed three radical 'abstract' works  The Toe Dancer, The Boatman and Boxers  in the Group's Goupil Gallery exhibition in March 1915. Although Roberts was only 19 years old, his work was known to the art critic of The Times, who, reviewing the exhibition under the headline 'Junkerism in Art', declared that 'Messrs. Lewis, Wadsworth, and Roberts are more rigid than ever. Their pictures are not pictures so much as theories illustrated by paint . . . They seem to have set their teeth firmly, and done their worst in a kind of aesthetic ascetism which prevents them from taking an interest in anything actual or concrete whatever' (The Times, 10 March 1915). Roberts went on to exhibit with the Vorticists in June, and was later called up for military service and then, like Wyndham Lewis, was commissioned as a war artist. It wasn't until 1922 that Roberts again exhibited with the London Group. His style was still strikingly modernist, but was now directed towards paintings of more recognisable, mainly urban, subjects. In May Novices and The Last 'Bus were shown at the Sixteenth London Group Exhibition. Then, in October, two large oil paintings The Gods (aka At the Hippodrome) and Dock Gates were exhibited at the Seventeenth London Group Exhibition. Artist and friend Edward Wadsworth bought The Gods (list price £90) for the Contemporary Art Society, and this purchase would have been of financial significance to William Roberts and his wife, née Sarah Kramer, as they were desperately poor and had a three-year-old son. They had been living in Mornington Crescent until recently, and the work's more familiar title, At the Hippodrome, may refer to the Camden Hippodrome, a local variety theatre that had become a picture-house from 1913 (and is now the KOKO music venue). 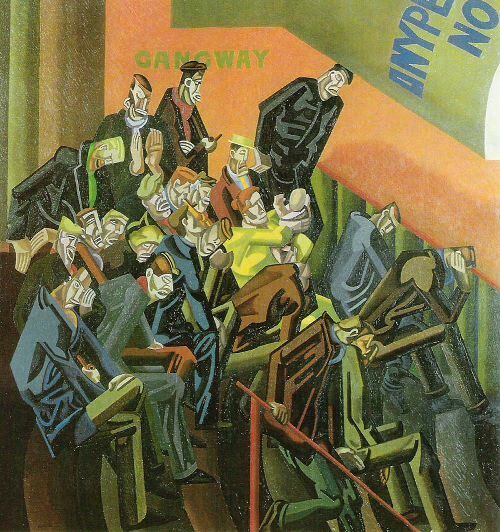 At the Hippodrome can be seen as a companion piece to Roberts's The Cinema, and his friend David Bomberg tackled a similar subject  Ghetto Theatre  all c.1920. Two decades earlier Walter Sickert had famously produced a number of music-hall works. Part of the artistic challenge for Sickert seems to have come from the combination of a dimly lit audience, the baroque decoration of the theatre, and often foreshortened or unusually framed views of the audience or performers. By contrast, Roberts eschews both lighting and perspective effects and presents us with a stark, fully lit auditorium. 'The Gods'  the inexpensive wooden benches situated almost in the roof of a theatre  seems also to refer ironically to the dejected and downcast individuals in the audience as unemployment in Britain had begun to rise. The iconography of primitive Oceanic masks is used to express their demoralisation. The Daily Mirror 's art critic was sarcastic about the challenging, modernism on show: 'The exhibition by the London Group at the Mansard Gallery contains the most advanced paintings in England. In fact, if they were a little more advanced they would be out of sight, a consummation devoutly to be wished for by those with old-fashioned ideas about form, beauty and colour' (Daily Mirror, 17 October 1922). There seems to have been no press comment specifically on The Gods; however, The Times was troubled by Roberts's other work in the exhibition: 'Mr. Roberts, in his "Dock Gates," has certainly achieved a curious, intricate, and vital design, but he has made great sacrifices of several accustomed elements of beauty to achieve it, and the picture leaves us bewildered both by what it has and by what it lacks' (The Times, 18 October 1922). But P. G. Konody, the Observer 's critic, provided a positive endorsement: 'Excellent work is also shown by . . . W. Roberts' (The Observer, 22 October 1922). These two London Group exhibitions in 1922 served as useful preparation for Robert's first one-man show, which was held at the Chenil Galleries in November 1923. Roberts would have appreciated the open and no-manifesto approach of the London Group, which was essentially an artists's cooperative. He usefully exhibited with them in 1925, 1926 and 1928, then occasionally in the 1930s and '40s, and in 1949 he created an affectionate watercolour The London Group Gives a Reception.